The Sun's corona, invisible to the human eye except when it appears briefly as a fiery halo of plasma during a solar eclipse, remains a puzzle even to scientists who study it closely. Located 1,300 miles from the star's surface, it is more than a hundred times hotter than lower layers much closer to the fusion reactor at the Sun's core. A team of physicists, led by NJIT's Gregory Fleishman, has recently discovered a phenomenon that may begin to untangle what they call "one of the greatest challenges for solar modeling" - determining the physical mechanisms that heat the upper atmosphere to 1 million degrees Fahrenheit (500,000 degrees Celsius) and higher. Their findings, which account for previously undetected thermal energy in the corona, were recently published in the 123-year-old Astrophysical Journal, whose editors have included foundational space scientists such as Edwin Hubble. "We knew that something really intriguing happens at the interface between the photosphere - the Sun's surface - and the corona, given the noticeable disparities in the chemical composition between the two layers and the sharp rise in plasma temperatures at this junction," notes Fleishman, a distinguished research professor of physics. With a series of observations from NASA's space-based Solar Dynamics Observatory (SDO), the team has revealed regions in the corona with elevated levels of heavy metal ions contained in magnetic flux tubes - concentrations of magnetic fields - which carry an electrical current. Their vivid images, captured in the extreme (short wave) ultraviolet (EUV) band, reveal disproportionally large - by a factor of five or more - concentrations of multiply charged metals compared to single-electron ions of hydrogen, than exist in the photosphere. The iron ions reside in what the team calls "ion traps" located at the base of coronal loops, arcs of electrified plasma directed by magnetic field lines. The existence of these traps, they say, implies that there are highly energetic coronal loops, depleted of iron ions, which have thus far eluded detection in the EUV range. Only metal ions, with their fluctuating electrons, produce emissions which make them visible. "These observations suggest that the corona may contain even more thermal energy than is directly observed in the EUV range and that we have not yet accounted for," he says. "This energy is visible in other wavelengths, however, and we hope to combine our data with scientists who view it through microwaves and X-rays, such as scientists at NJIT's Expanded Owens Valley Solar Array, for example, to clarify mismatches in energy that we've been able to quantify so far." There are various theories, none yet conclusive, that explain the sizzling heat of the corona: magnetic energy lines that reconnect in the upper atmosphere and release explosive energy and energy waves dumped in the corona, where they are converted to thermal energy, among others. "Before we can address how energy is generated in the corona, we must first map and quantify its thermal structure," Fleishman notes. "What we know of the corona's temperature comes from measuring EUV emissions produced by heavy ions in various states of ionization, which depends on their concentrations, as well as plasma temperature and density," he adds. "The non-uniform distribution of these ions in space and time appears to affect the temperature of the corona." The metal ions enter the corona when variously sized solar flares destroy the traps, and they are evaporated into flux loops in the upper atmosphere. Energy releases in solar flares and associated forms of eruptions occur when magnetic field lines, with their powerful underlying electric currents, are twisted beyond a critical point that can be measured by the number of turns in the twist. The largest of these eruptions cause what is known as space weather - the radiation, energetic particles and magnetic field releases from the Sun powerful enough to cause severe effects in Earth's near environment, such as the disruption of communications, power lines and navigation systems. It is only through recent advances in imaging capabilities that solar scientists can now take routine measurements of photospheric magnetic field vectors from which to compute the vertical component of electric currents, and, simultaneously, quantify the EUV emissions produced by heavy ions. "Prior to these observations, we have only accounted for the coronal loops filled with heavy ions, but we could not account for flux tubes depleted of them," Fleishman says. "Now all of these poorly understood phenomena have a solid physical foundation that we can observe. We are able to better quantify the corona's thermal structure and gain a clearer understanding of why ion distribution in the solar atmosphere is non-uniform in space and variable in time." Scientists at NJIT's Big Bear Solar Observatory (BBSO) have captured the first high-resolution images of magnetic fields and plasma flows originating deep below the Sun's surface, tracing the evolution of sunspots and magnetic flux ropes through the chromosphere before their dramatic appearance in the corona as flaring loops. EUV emissions, however, can only be observed from space. The SDO, aboard a spacecraft launched in 2010, measures both magnetic field and EUV emissions from the whole Sun. The implications of the corona's temperature structure, and whether it allows the Sun to transfer more heat into the solar system, "is the subject of future study," Fleishman says. It can safely be said, magnetic reconnection has nothing to do with the corona or its temps. 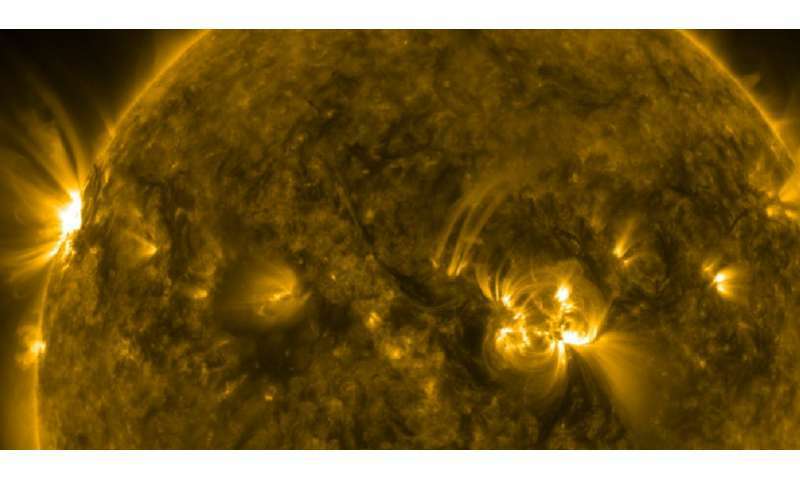 'Energy releases in solar flares and associated forms of eruptions occur when magnetic field lines, with their powerful underlying electric currents, are twisted beyond a critical point that can be measured by the number of turns in the twist." "We call such areas of heavy ion concentration the "ion traps." These traps hold enhanced ion levels until they are disrupted by a flare whether large or small." Their observations further support the electric Sun and EU. They are describing a process of electric discharge, the flare is the discharge. The discharge depletes the ion sump in the same breakdown process that causes lightning on Earth. It's an electric discharge process and is well described by EE, no funny farm physics of magnetic reconnection need be used. The cooler surface and much hotter atmosphere is exactly what is observed in the Safire Project. There needn't be mysteries, just correct application of theory. I am curious why there must exist actual plumes of returning non-ionized iron atoms. For one thing, I could easily postulate how iron ions, once they lose their ionization energy to the upper atmosphere are either carried into the solar wind or returned as a non localized sort of iron atom "rain". Secondly, I cannot image that even after 5 billion years that the enormous amount of iron in the total mass of the sun has been diminished by a relatively slow loss at the surface. Assuming 100% discharge of iron ions into the solar wind, we can calculate approximately the absolute amount of iron lost over a period of time. If stars naturally lose iron as they age, we should see evidence observationally. All of these calculations are required to even speculate about how many iron atoms return to the surface, ionized or not. The only advance in solar understanding is V Zharkova's theory as to a second magnetic layer in the sun. IF this is correct, then possibly the solar minimum is when the underlying magnetic field releases energy at the solar equator. This 'energy' take s the form a massively compressed spherical gas ball. These are the reason our science rushed to identify 'gravity waves' and the reason for the claims of refracted solar images generated by this compressed magnetism as being a 'second sun', fresnel lens reflector, alien planet, etc. Possibly the experiments at the collider are to generate a compressed magnetic field body that would be unaffected by gravity. I am curious why there must exist actual plumes of returning non-ionized iron atoms. To escape the sun and not fall back you have to achieve escape velocity. To get an atom to escape velocity a certain amount of impulse has to be imparted to it. For iron that impulse is roughly 55 times that required for a hydrogen. So it would not surprise me if the solar wind were skewed towards lighter particles and not identical in composition to the solar atmosphere. They also produce iron - especially as they get really old. Judging from the amount of BS you've managed to squeeze into your short post, there's evidently a Brown Hole involved there. ...and, you're tapping the Zero Idea field. ⓆⓌⒺⓇⓉⓎ ... it's in the post! 1) Where is the incoming current to the Sun? Still haven't seen that yet. 2) What happens to your SAFIRE plasma when they turn their DC power supplies off? you sure are reaching with those links, aren't you? For the second link, why is it only pulsars that have on-off switches?